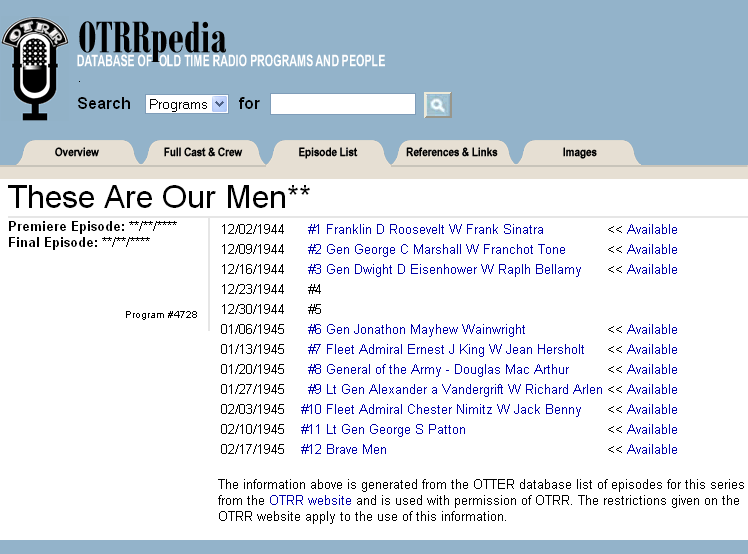 The Definitive These Are Our Men Radio Article and Log. "The Parker Watch Company dedicates this program to the United States Treasury Department for the sale of War Bonds." The closing sequence each week reminds listeners to buy bonds. 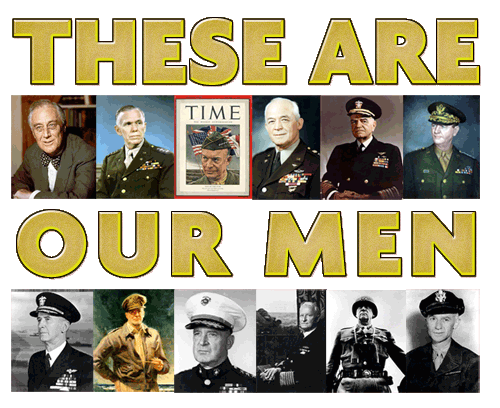 "These Are Our Men" is presented each Saturday by the Parker Watch Company, but not to sell Parker watches. Their aim was to remind as many millions of Americans as They could reach that "certain as we are in our ultimate victory, it can be too long delayed unless every one of us carries his share of the burden." and "What we ask you to do is buy bonds, bonds, and more bonds. There's no duty more important to Americans today." Fast forward five years and The Parker Watch Company has been forced out of business--one hopes not simply over their largesse in promoting War Bonds over their own products during their 3-month sponsorship of These Are Our Men. So ends the post-script to this patriotic send-up during the waning years of World War II. Run Dates(s)/ Time(s): 44-12-02 to 45-02-17; NBC; Twelve, 30-Minute programs; Wednesdays, 9:30 p.m.
You're welcome to compare our fully provenanced log below with the 1,500 'expert researchers' at the OTRR and their own These Are Our Men log. We've provided a screen shot of their current log for comparison, HERE. What you see here, is what you get. Complete transparency. Here's how we did it--for better or worse. Here's how you can build on it yourselves--hopefully for the better. Here's the breadcrumbs--just follow the trail a bit further if you wish. No hobbled downloads. No misdirection. No strings attached. We point you in the right direction and you're free to expand on it, extend it, use it however it best advances your efforts. 44-12-02 San Antonio Express - THESE ARE OUR MEN 1:00 P.M. Super-show dramatizing lives of American military leaders. Today's subject: President Roosevelt. Guest Star: Frank Sinatra. Announces Gen George C Marshall starring Franchot Tone as next. Announced as second in series, Franchot Tone as next star. Annouced as third in series; next star Paul Muni. Jean Herscholt stars, MacArthur with Ralph Edwards announced as next. Ralph Edwards stars, announced as eighth in series. Richard Arlen stars, Admiral Nimitz announced as next. Jack Benny stars, announces Gen George Patton with Miriam Hopkins as next. 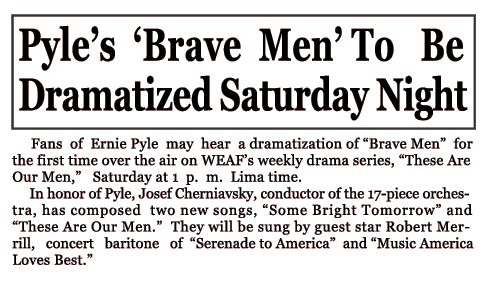 Miriam Hopkins stars, announces Brave Men by Ernie Pyle with Robert Merrill as next.